Hamlet’s parking space, Elsinore Castle, Denmark. Watercolor over pencil in Moleskine 5×8 sketchbook. The cannons aim at Sweden, the gift shop sells Viking helmets, and Horatio gives guided tours. And pied wagtails forage in yon grassy swale, Anon. I like touring with a sketchbook. It requires something from me, the tourist. 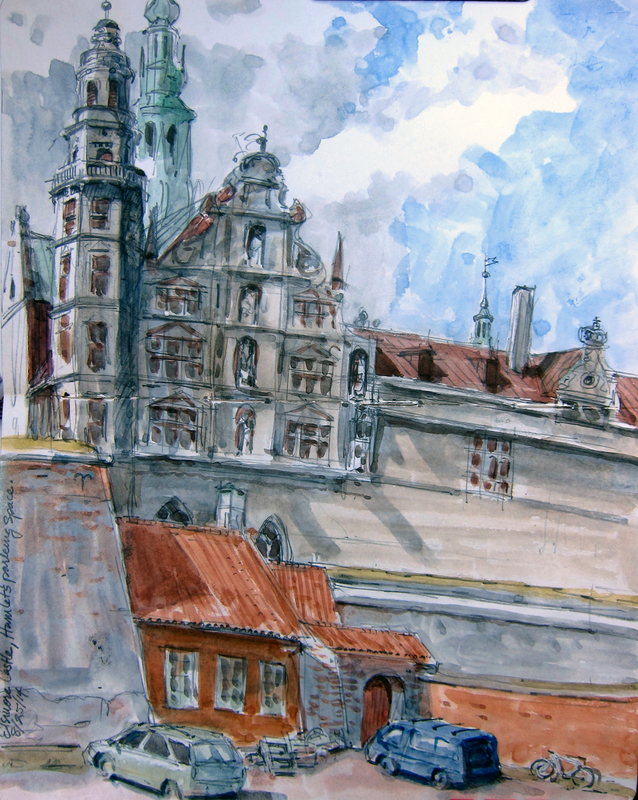 Drawing becomes an indelible piece of my travel experience, glued by hand into the flapping scrapbook pages of memory. The Storkespringvandet, or Stork fountain, in Hojbro Plads in the heart of Copenhagen’s well-heeled Stroget shopping district. According to tradition, (which may turn out to be apocryphal) newly graduated town midwives join hands and dance around the stork fountain (fertility rites could be good for business). I rented a table and beer here for 54 kroner and sketched until the beer wasn’t. Watercolor over pencil in 5×8 Moleskine. The camera is essential, of course, and catches more images than the sketchbook ever will. I’m having a ball with the camera, too. But when hand and eye meet travel’s fresh wonders, it’s fun to see how biology renders the pictures. Jugglers walking on Slotsholms Canal, Copenhagen, and me, right behind them, camera in hand. I keep walking into delightful surprises here in Copenhagen. 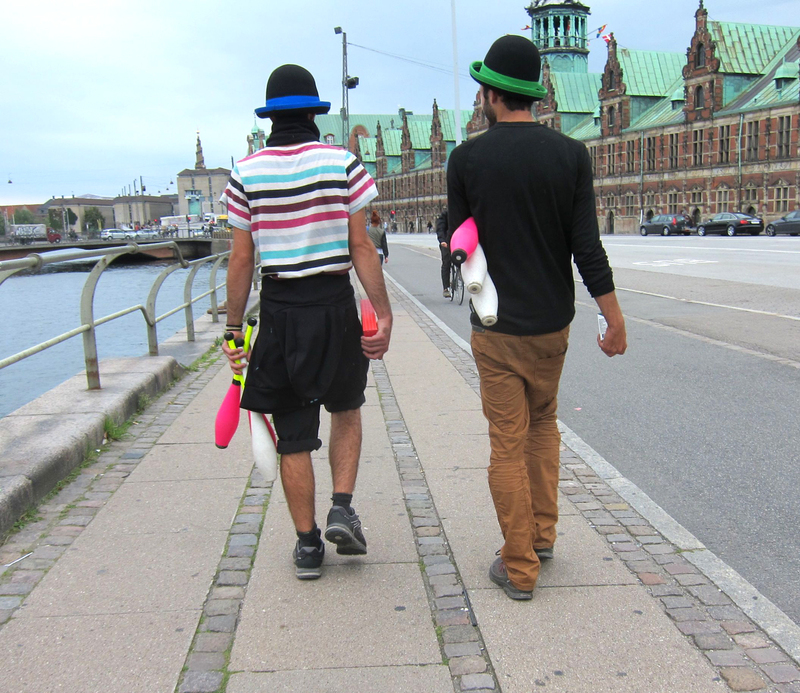 Today it was a pair of jugglers heading home from work. 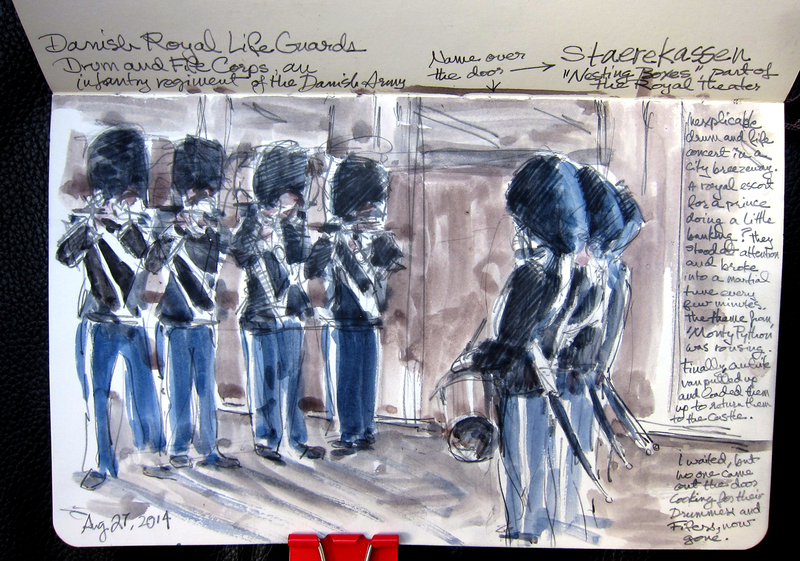 Yesterday it was the Royal Danish Army Fife and Drum Corps standing in the resonant vaulted passageway behind the Royal Danish Theater and playing, of all things, a medley of Monty Python hits. The Danish Royal Army’s Fife and Drum Corps playing on the street in Copenhagen. Watercolor over pencil, Moleskine 5 x 8. 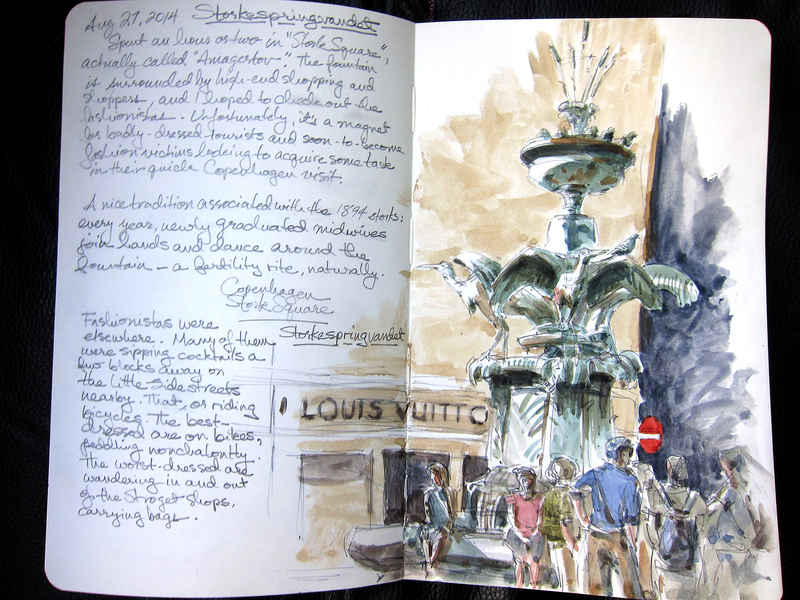 I guess the downside of being a sketchbook tourist is not being camera-ready when it counts. Busy drawing, I missed those famous first notes. But the rest of them are glorious. Enjoy. Thanks for the Monks Square tip- I’ll get over there posthaste and see what table rental comes to. Very much appreciate the suggestion! What fun! I love to see your sketches! And just this morning I was thinking I needed to find out why things had been so quiet in the mot-mot corner. Now I know! Catch up when you return?